TT-30R (also known as RV 30) is a standard outlet for travel trailers- this is what TT in the part number stands for. It is common in most caravan parks and recreational vehicles in North America. The maximum power rating of this receptacle is 125×30= 3750 VA. Practically, with 20% safety margin and because a generator produces only 120V rather than 125, you can use it for up to 120x30x0.8=2,880 VA. The mating plug TT-30P is suitable for cables with three 10 AWG wires. Black or red lead goes to Line, white to Neutral (W) and green to Ground (see the diagram above). 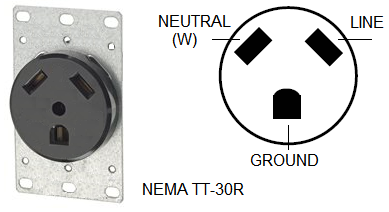 It is important to note that this connector is NOT interchangeable with NEMA 10–30, which looks similar, but is used for 120/240V service.